For other uses, see Zest (disambiguation). Zest is a food ingredient that is prepared by scraping or cutting from the outer, colorful skin of unwaxed citrus fruits such as lemon, orange, citron, and lime. Zest is used to add flavor to foods. In terms of fruit anatomy, the zest is obtained from the flavedo (exocarp) which is also referred to as zest. 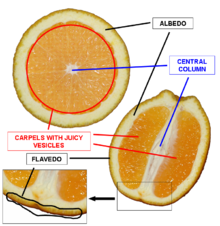 The flavedo and white pith (albedo) of a citrus fruit together makes up its peel. The amounts of both flavedo and pith are variable among citrus fruits, and may be adjusted by the manner in which they are prepared. Citrus peel may be used fresh, dried, candied, or pickled in salt. Cross-section of an orange. The flavedo is zested; the bitter white albedo or pith is generally not used. More orange flavedo than white albedo; contrast with orange, right. Zesting a lime; the white mesocarp is visible where some of the green flavedo has been cut away. 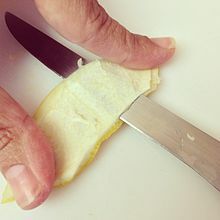 Slicing mesocarp from flavedo to make marmalade, using a flexible filet-style knife. For culinary use, a zester, grater, vegetable peeler, paring knife, or even a surform tool is used to scrape or cut zest from the fruit. 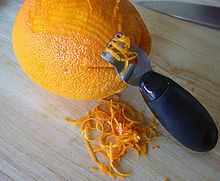 Alternatively, the peel is sliced, then excess pith (if any) cut away. The white portion of the peel under the zest (pith, albedo or mesocarp) may be unpleasantly bitter and is generally avoided by limiting the peeling depth. Some citrus fruits have so little white mesocarp that their peel can be used whole. Dried mandarin peel used whole as a seasoning (chenpi in Chinese). The zest and mesocarp vary with the genetics of the fruit. Fruit with peels that are almost all flavedo are generally mandarines; relatives of pummelos and citrons tend to have thicker mesocarp. The mesocarp of pummelo relatives (grapefruit, orange, etc.) is generally more bitter; the mesocarp of citron relatives (Mexican and Persian limes, alemows etc.) is milder. The lemon is a hybrid of pummelo, citron, and mandarin. The mesocarp is also edible, and is used to make succade. Zest is often used to add flavor to different pastries and sweets, such as pies (e.g., lemon meringue pie), cakes, cookies, biscuits, puddings, confectionery, candy and chocolate. Zest also is added to certain dishes (including ossobuco alla milanese), marmalades, sauces, sorbets and salads. Zest is a key ingredient in a variety of sweet and sour condiments, including lemon pickle, lime chutney, and marmalade. Lemon liqueurs and liquors such as Licor de oro require zest. Zest is used in some cocktails not only for flavor and aroma but also for color as a garnish. For use as a cocktail garnish, zest often is cut in a long spiral called a twist. Cocktails featuring a twist include Dry Martini and Horse's Neck. For maximum flavor and aroma, as in mulled wine, zest is simply cut from the fruit with a knife. The fungicide enilconazole (commonly known as Imazalil) is a known carcinogen widely used to grow citrus crops. 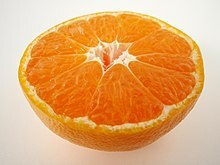 An exposure standard governing the outer skin of a citrus fruit would likely differ from an exposure standard governing the fruit pulp. Depending on the chemical present and the degree of concern, a consumer might wish to wash or roughly scrub an item of citrus fruit prior to zesting the peel. ^ Bender, David (2009). Oxford Dictionary of Food and Nutrition (third ed.). New York: Oxford University Press. p. 215. ISBN 978-0-19-923487-5. ^ Karp, David (March 13, 2014). "The wild and elusive Dancy". Market Watch. LA Times. Retrieved December 7, 2018. ^ "World Spice Plants". google.com. Wikimedia Commons has media related to Citrus zest. This page was last edited on 13 December 2018, at 01:12 (UTC).